Defines what a student should know and be able to do as result of an effective physical education program. 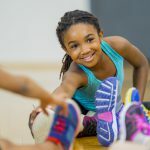 Identifies the critical policies and practices that guide school districts and schools in developing an effective school physical education program. Helps school districts conduct a clear, complete, and consistent analysis of written physical education curricula, based on national physical education standards.